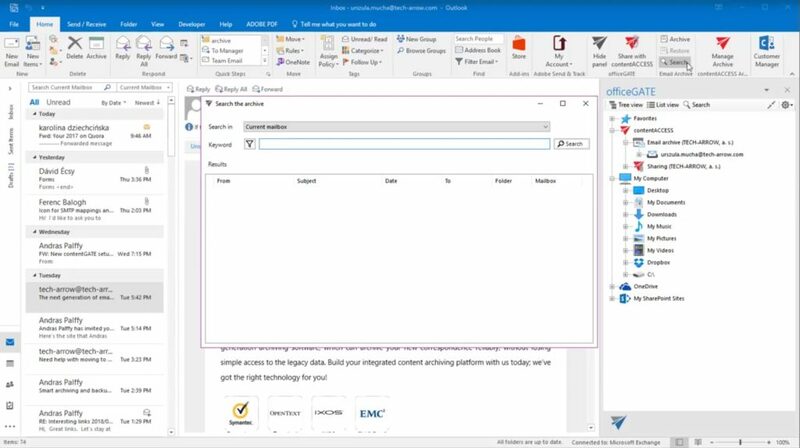 Check out the new version of officeGATE with its enhanced search functions for your Office 365 archive. Our smart Outlook add-on enables you to find your archived mails, files and documents easily. Are you struggling with big amount of emails and have problem with finding particular one quickly? Or maybe you need to archive new mails easily or restore them to the original state quickly? We know how important is your time and we respect it. The new version of officeGATE with its enhanced search functions allows you to find your mails by certain criteria like sender’s name, importance, date, subject or attachment presence. It makes you able to narrow down the scope of the search query. The search can be executed across only your mailbox or other, to which you have necessary permissions. From now on, users don’t need to download the MailApp to archive or restore emails. All they need to do is to click one button in officeGATE. If you would like to learn more about the great new features of officeGATE, click here. If you would like to learn about a safe way of archiving your emails, click here. Work with your emails quickly and efficiently. Use officeGATE and upgrade your daily working routines to the next level!